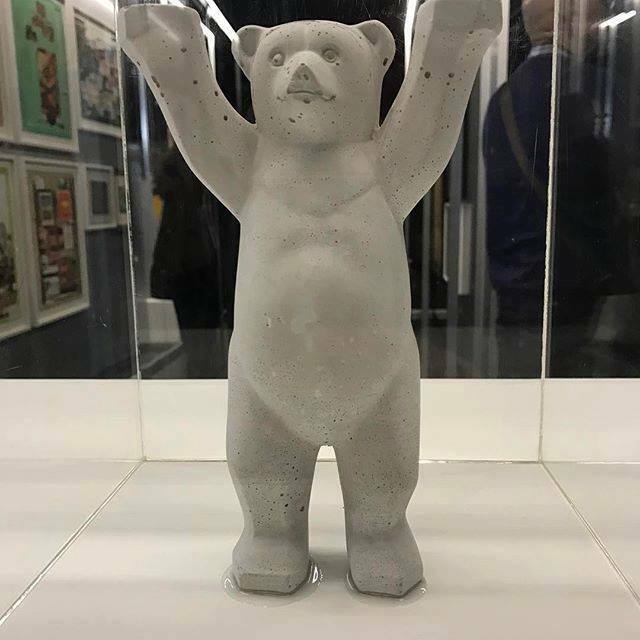 Khaled Jarrar’s Buddy Bear (2013) is part of 100 Masterpieces of Modern and Contemporary Arab Art at the Institut du Monde Arabe, an exhibition highlighting the Barjeel Collection. 100 Masterpieces features a selection of works from the Sharjah-based art foundation in a variety of media, spanning several decades of art production in the Arab world, and includes seminal artists like Marwan Kassab Bachi, Hassan Sharif, Etel Adnan, and Shakir Hassan. Jarrar’s Buddy Bear belongs to a series of objects that he fashioned out of reconstituted concrete from Israel's apartheid wall in the West Bank. The sculpture references the eponymous public art project that was launched in Berlin in 2001 as a symbol of global unity. Although not affiliated with the project, Jarrar’s bear presents a tragic twist, emphasising the experiences of Palestinians living under the Israeli occupation. Image: Khaled Jarrar, Buddy Bear, 2013, Reconstitued concrete from Apartheid Wall. Courtesy of the Barjeel Art Foundation.